The website of Burlington-based design firm Moderate Breeze touts hip graphics for Burton Snowboards and a print piece for "The Art of a Political Revolution," a 2016 touring exhibition of artists and musicians supporting then (and now) presidential candidate Sen. Bernie Sanders (I-Vt.). Moderate Breeze principal Marin Horikawa once worked as a creative director at former JDK Design, focused on snowboards and engaging with artists around the world. Now he'd like to establish a conduit for American companies seeking to launch in his native Japan. It may seem unusual that an accomplished designer with international connections would open a petite art gallery — particularly one tucked away on the second floor of a Church Street building and open only by appointment. Doesn't an art gallery need visibility and foot traffic? Horikawa aims to buck that conventional wisdom. 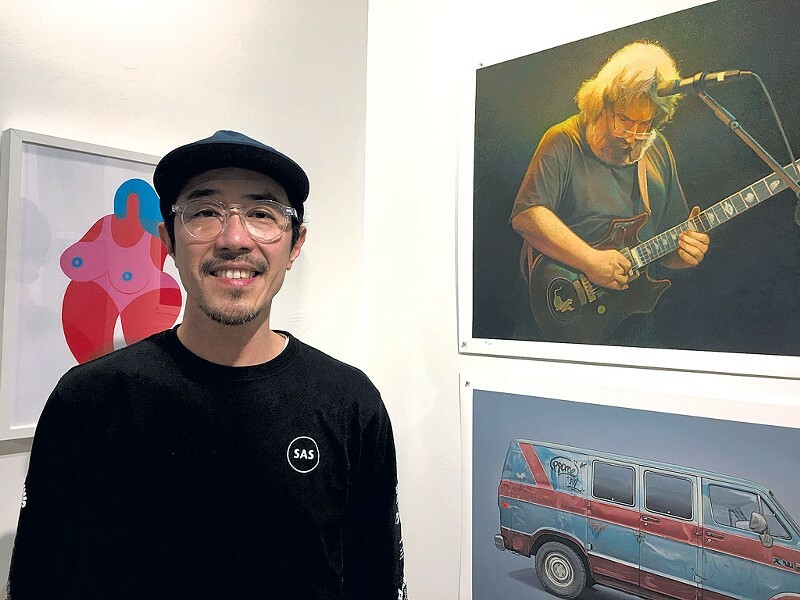 When he opened the Safe and Sound Gallery with a reception earlier this month, the modest space in the Richardson Building — which doubles as the office for Moderate Breeze — quickly filled up with acquaintances from the design and snowboard communities, as well as curious art aficionados. A handful of works from just three artists was on display: the bold, minimalist graphics of Vermonter Jackson Tupper; a realist portrait of Jerry Garcia and other, more cartoonish drawings by Brooklyn-based Scott Lenhardt; and paintings of graffiti-tagged vans by Kevin Cyr, who lives in Maine. All three artists showed up at the reception; all are connected through snowboard design. "Basically I'm working with that circle of creatives," Horikawa explained. He intends for that circle gradually to widen. Though he acknowledges that operating an art gallery in Burlington is challenging, Horikawa seems undaunted by practicalities. His mission: "I want to change the way people buy art," he declared. "This, for me, was the answer." Perhaps ironically, given the gallery's obscure location, that means taking "a more accessible approach" to selling art. Horikawa wants to work with "10 or 15 artists" and facilitate deeper relationships between artist and client. "I want to show their personalities, their process," he said, adding that he intends to make a video of each artist for the gallery website. His interest in showing how artists do what they do was inspired by a 7-year-old — his daughter, Bea. The budding artist "is hungry for learning techniques," he said. Lenhardt gives a thumbs-up to Horikawa's approach. "If you know Marin, then you trust him and his ideas," he wrote in an email. "I think that is what most artists look for when showing with a new gallery. It can only be a good thing that he's connected to so many creatives, who would all jump at the chance to work with him." Horikawa is offering high-quality, limited-edition prints — a more affordable entrée to art collecting. To be sure, clients can also purchase originals: Lenhardt's pensive oil portrait of Garcia, for example, goes for a cool $12,000; Cyr's oil-on-panel painting of a turquoise-and-brown van is $7,500. Prints tend to run less than $300. 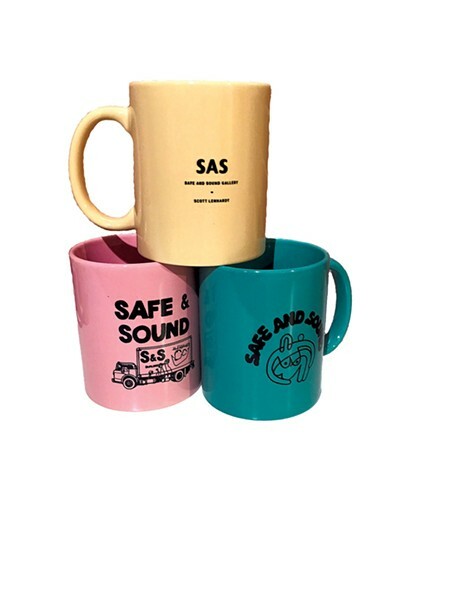 And for those with an even skimpier budget, all three artists contributed designs to SAS Gallery's pastel-colored mugs, $16 each. Born in Tokyo in 1974, Horikawa did not have a straight shot to Burton in Vermont. He came to the U.S. at 18, right out of high school. "I wanted to go to Portland, Ore.," he said. "I was just getting into snowboarding." His father had other ideas, offering to pay for his son to attend an ESL program at Butler University in Indianapolis. "I lasted eight months," Horikawa said. From there he attended a junior college and worked in snowboard retailing in Philadelphia, then got a BA in graphic design in Denver. "Back then Burton didn't have a design department, so I did a little research and found JDK," Horikawa said of the once robust Burlington firm. "I got a job there and spent 13 years as design director responsible for Burton graphics." He met his wife there, too; they now have two children — Bea and a 3-year-old son — and live in Charlotte. Horikawa, who has a green card, said he eventually wants to become a U.S. citizen. "Japan doesn't allow dual citizenship," he noted. But he'll wait "out of respect for my parents." Visiting his family back in Tokyo has inspired Horikawa to use his connections to set up U.S.-Japan enterprises. He's even considered importing maple syrup. Meantime, Safe and Sound Gallery is "the most organic evolution for me," Horikawa said. He wants to get more exposure for his local artists and bring national ones to Burlington, mounting an exhibit every three months. And he wants to teach people how to buy art. "Some people don't know how or where to look," he said. "People buy a house, a couch ... art is the last thing." It might take time to change that, Horikawa acknowledged. "But I'm interested in that. I feel like people are really interested in [the values] behind what they buy. I have this wild idea: Can we sell art before it's created?" By that he means, for example, introducing an artist to a potential buyer who will follow, via social media, the artist's process of making a work. "It's like buying a house that's being built," Horikawa suggested. "The buyer can't dictate the art but will have a personal connection to it." Whether the nascent gallerist can sell this idea, or the artworks, remains to be seen. If he does, Horikawa said he wants to give back to his local community by donating 10 percent of proceeds to art-related endeavors. "I don't know where yet," he conceded. "Maybe I'll buy art supplies and encourage kids to do art." Sounds like an idea his daughter would approve. The original print version of this article was headlined "Safe and Sound Gallery Opens Small, With Big Plans"